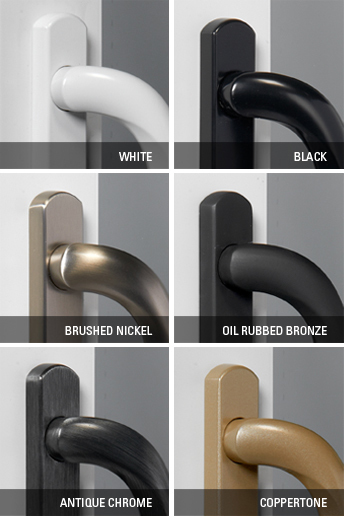 shaped metal handles are offered with exterior/interior grip. Bet you can open the door with just a finger tip! The easiest door to open in its category. Smooth and quiet sliding doors that feature sturdy, patented dual-tandem wheels that now include sealed bearings for even longer life. Our lock has retractable latches that won’t break even if the door is closed with them in the closed position. All of our standard locking mechanisms are anti-slam and encased in galvanized steel reinforcement. 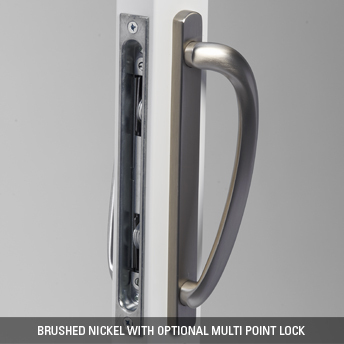 A multi-point locking system (optional) provides optimum security and resistance to forced entry.